As You Know, missiles are very effective anti-vehicular weapons because when fired, they track down and follow their target to ensure they hit. This also makes them very cool. But you know what would be cooler? If we had lasers that did the same thing! Who cares if they have no known or plausible way of steering and don't possess the correct attributes to identify a target?! They make for some amazing action sequences, and that's all that matters. If a sci-fi work contains these, it's more than likely to be on the softer side of the sci-fi spectrum. Often causes the one on the wrong end to have an Oh, Crap! moment, especially if they think the shooter has missed, and may be Lampshaded with "How Is That Even Possible? ", depending on the hardness of the setting. Or at least, how hard they think it is. Subtrope of Frickin' Laser Beams, and Sister Trope to Homing Projectile, which can also overlap with Impossibly Cool Weapon. May involve but is not strictly limited to Roboteching and often leads to a flashier version of the High-Speed Missile Dodge. This is NOT simply Beam Spam, where so many beams are fired that the target will get hit solely because of the sheer number of beams (though there's no reason you can't spam homing lasers). It also excludes guns that auto-tracks to keep an otherwise normal, straight-flying beam on the target and any remote reflection, refraction or beam-bending/splitting devices that can be made to aim at a target. Also does not count if the beams simply bend randomly in-flight; they must actively chase the target(s) in question. This trope is not strictly limited to lasers per sé. Particle beams and beams of Pure Energy also count, as do beams or bolts made of any kind of in-universe phlebotinum. Hard Light projectiles also count, though only if they do not imitate the workings of conventional homing weapons. This is where it overlaps with Homing Projectile. Gunbuster is the Trope Namer for this, as can be clearly seen from the page quote. Nadia: The Secret of Blue Water has these as one of the Nautilus' primary armaments. Of course, the director was Hideaki Anno (who also made the Trope Namer, Gunbuster several years earlier). Gundam has several examples, though it is very slightly more plausible in that they are particle beams rather than actual lasers. In the main Universal Century setting, this is explained by making advanced use of I-fields (particle-repellent energy fields) to shape a beam weapon's trajectory, letting mobile suit designers literally cover their creations with beam guns without having to worry about whether they're pointed in a useful direction or not. Mobile Suit Gundam SEED has the Forbidden Gundam's primary cannon, which often fires in a curve. Forbidden can also curve enemy beams away from itself. Mobile Suit Gundam 00 features a very big one mounted on the Mobile Armour "Regnant", which can curve once after being fired. Mobile Suit Gundam AGE has SID's numerous beam weapons, all of which can curve and home in on targets. Gundam: Reconguista in G features the Elf Bull mobile suit, which spams the things! Numerous examples exist in the Eureka Seven universe, including the Devilfish and The END. The same goes for the Eureka Seven Ao universe, particularly where the Secrets are concerned. It gets lampshaded at one point. Zegapain also features these, in the form of the Hraesvelgr's "missiles", which despite their name appear to be simple chunks of Hard Light with no known internal computation systems, aerodynamic properties or explanation of how or why they are capable of following targets other than Rule of Cool. Umineko: When They Cry has Magitek looking bullets of Hard Light that curve a multitude of times to seek out their target, even flying through keyholes to get at their victims. In Naruto there's one Storm Release (Water + Thunder) Technique that shoots a volley of laser-like bullets that home on the target curving and bending midair. On several scenes of the Gall Force OVA, many ships fire lasers at each other that make 90-degree turns to hit their targets. Krillin from Dragon Ball did this with Ki blasts in his World Tournament match against Piccolo. Frequent in the franchise, especially once Dragon Ball Z begins and the number of characters able to use energy blast-style attacks skyrockets. Somewhat more justified than most because the blasts are connected spiritually to the firer. Xam'd: Lost Memories: The Hiruken Emperor uses these as one of his primary methods of attack. LOTS of 'em! At the climax of YuYu Hakusho the Movie: Poltergeist Report, Yusuke's normally line-of-sight reigun is able to do this thanks to its energies combining with those of his teammates. In Date A Live Mana Takamiya uses these when fighting the spirit known as Nightmare. She has limited reality warping tech that is used to do it. The Lyrical Nanoha franchise has Nanoha's Axel Shooter, a magical Beam Spam whose every movement she can control, allowing her to track and shoot down multiple targets at once. Kill la Kill has LOTS of these coming from Nonon Jakuzure's Symphony Regalia Mk. II, that are made out of music! Superman: Darkseid's omega beams can do this. Justified in that he is canonically a god. In Marvel, the beams produced by the Ultimate Nullifier are capable of homing in on an individual target in an entirely separate star system. One of the earliest examples of homing lasers in video games is Taito's RAY Series starting with RayForce. You (and a partner) take control of a Space Fighter capable of firing multiple homing lasers at once. Some enemies and bosses can shoot homing lasers as well. SITER SKAIN's The Tale of ALLTYNEX series of doujin shoot 'em ups loves this trope as much the RAY series. In ALLTYNEX Second, a remake of the little-known FM Towns game ALLTYNEX by the same creator, you take of a fighter that transform into a semi-mecha that can use homing laser along with a vulcan cannon, beam swords, and a Wave Motion Gun. The same goes for the original FM Towns game. In RefleX, which is also a remaking of a PC game called Reflection (that's also freeware), your ship can reflect them. Kamui has bosses like the ALLTYNEX OS that uses them, too. If you use your Lightning Blade, you can reflect them back at enemies. Edelweiss' Ether Vapor has a fighter craft called the Ex-tio that uses a weapon that fires an endless (albeit fairly average in fire power) barrage of homing lasers, which like in the RAY series is needed to shoot stuff in the background. The eponymous Silverguns of Radiant Silvergun have a combination of weapons that activates the ship's lock-on homing lasers. The final boss of its Spiritual Successor, Ikaruga, will fire these in alternating polarities and you must absorb them to shoot it back. Get good at it, and it will begin to throwing in bullet spam with it. Crimzon Clover is what you'd get if RayForce was made by CAVE. The Type-1 ship fires lasers whereas Type-2 fires missiles. The Orbital Frames of Zone of the Enders are known for mixing this with Beam Spam, particularly Jehuty and Anubis. G.rev's hybrid of Shoot 'em Up-meets-Fighting Game series Senko no Ronde features some mechs known as Rounders with homing laser weaponry (e.g. Changpo's Citronette or Lili's Brinstä), even more so with certain B.O.S.S. Shells and in-game bosses. Some of the Virtuaroids of Sega's Cyber Troopers Virtual-ON like Viper-II (and the later descendants) have an homing laser attack. Charged shots from a plasma pistol will curve off after the nearest target. They won't robotech, but the path of the bolt will bend by up to about fifteen degrees. In Halo 5: Guardians, the Boltshot's and Suppressor's Hard Light shots will track foes, and the Scattershot's hard-light rounds will also do so if you first ricochet them off a surface (the "Didact's Signet" variant does this particularly well). The larger scale Covenant plasma torpedoes (first seen briefly in the "escape from the Pillar of Autumn" cutscene in Halo: Combat Evolved, but elaborated upon by the expanded universe) are bolts of plasma contained in a magnetic field generated by the vessel that fired them projected over the intended target. As such, it merely appears as if the bolt is chasing the target, when in fact the weapon appears to be more of a continuous "beam" that simply alters its angle to keep on the target, as the plasma bolt is just made to follow the natural path of the field as it tracks. The Predator uses a Plasma Caster that shoots Plasma bolts. It follows the laser sight built into his helmet and in the Alien vs. Predator games, the bolt actually homes in on the target. Very useful against those fast-moving aliens! Even though it's not a laser, but a plasma bolt, almost every mod for the games removes the homing capability because the PLASMA CASTER DOESN'T WORK THAT WAY! In Saga, which is an RPG instead of a Rail Shooter, the downside is instead that they lock-on to targets automatically and indiscriminately, which can be a problem with large crowds if they target several weak Mooks when you wanted to hit a strong one. Its Spiritual Successor, Crimson Dragon, have these too. E-102 Gamma in Sonic Adventure, as well as Tails and Eggman from Sonic Adventure 2, are equipped with homing lasers that behave extremely similarly to Panzer Dragoon's. However, they are platformers with mostly static targets, and not rail shooters where the targets would inevitably go out of range of their own volition. To counter this, the targeting laser eventually dies out, losing your lock on every target, requiring players to lock onto all targets within a short timeframe if they want to fire anything. R-Type's Green powerups fire a laser that bends to hit enemies. Terra's weapon from Mega Man V, Spark Chaser. Not only it homes on your enemies, but a single laser can hit multiple times. Ranged energy weapons in StarCraft noticeably curve off after moving targets, even pursuing them beyond their normal attack range. Super Robot Wars Z Saisei Hen features a new Anti-Gurren Lagann, which fires pink/ purple beams from the ports all over its body that home in on their target, even those fired from the back of the mecha. Solatorobo: The Titano-Machinas' lasers bend at right angles before going to the target. In Jak 3: Wastelander, the final Blue Eco Mod for Jak's Morph Gun is the Needle Lazer. You don't even need to aim the gun at your enemies because the laser bullets will find them for you. The doujin mecha game series Windom XP features Gundam-esque mechs based after Windows and Linux operating systems that can spam homing lasers from one of their sub-weapons. 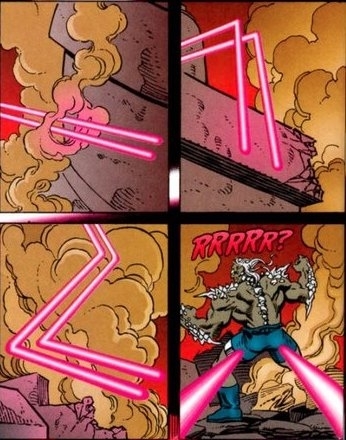 Axelay had several examples of bending/homing lasers. The Area Flat series has homing lasers both used by the player and enemies. In Rez, this is your only weapon. Its successor, Child of Eden, added a rapid fire beam, but kept the homing laser as your primary method of attack. Raiden II has the purple Plasma Laser. When fully charged, it will lock onto any available target and coil all over the screen. In Kolibri, one available weapon is a laser that curves around to hit enemies. Lasers in Sid Meiers Starships certainly act like regular lasers, requiring a direct line of sight and reducing in effectiveness if there's something in the way. However, the animation shows them weaving around and braiding themselves on the way to the target. The plasma cannons, on the other hand, are short-range, direct fire, and don't deviate once fired. Blaster bolts in Star Wars: The Old Republic tend to change their trajectories and home in on their targets. This might not be noticeable to a force user who casually deflects bolts with their lightsaber, but use a More Dakka class like the Trooper, and it will become evident. The total reverse of Imperial Stormtrooper Marksmanship Academy. Dogyuun has the purple and red weapons. The purple laser curves into enemies, while the red laser homes in via 90-degree turns. In Rapid Reload for the PlayStation, the player weapon "H" is a homing laser that fires in serpentine bursts. The player's robots in the Ex Zeus series are armed with homing missiles that can pull off some crazy twists and turns as they home-in on their target, sometimes even spiral their way to them. Phantom Brave: The skill "Ancient Mist" is a homing laser-style attack. Earth Defense Force: Wing Diver/Pale Wing(in Japan), have several weapons that are homing lasers that lock onto and pursue enemies. Arc Angle: Your character's method of 'attack' uses a cone of light which converts enemy bullets into "Holy Bullets" that resemble orbs of light. Said Holy Bullets then home back in on sender. Gecko, the third Mini-Boss attacks almost exclusively with laser attacks, one of which is a long yellow homing laser that will chase the player around. The Final Boss of has two variants of this. Blue ones will constantly chase you for a period of time, red ones will slow to a crawl as they attempt to chase you before suddenly speeding up but losing most of their homing function. It becomes problematic when the boss decides to use both of them together. Legend, of Worm, is capable of projecting lasers from any point on his body, and can guide their path — even to the point of making them turn corners. As previously mentioned, Darkseid's Eye Beams follow the target. In Justice League, Batman became the first human to dodge them, which earned Darkseid's respect. In Ben 10: Alien Force, the previous Big Bad, Vilgax returns with new powers, including Eye Beams that do this. Voltron: Legendary Defender: Voltron's BFG shoulder-cannon can fire a barrage of homing energy beams. To a degree (a very, very, VERY SMALL one), this is technically Truth in Television, as this video's first example shows, meaning that all lasers (which are made of light) are indeed drawn toward ANYTHING with energy and momentum. Just nowhere near enough to be noticeable or count for anything. While not an actual laser some military directed energy weapon researchers have theorized that magnetically contained plasma could act in the spirit of this trope by manipulating the magnetic field. A plasma sheath shaped using electromagnetic fields has been proposed as a method to steer projectiles or aircraft without needing flaps or fins.